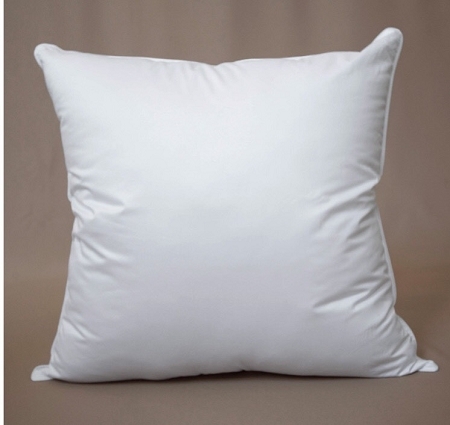 This product #520 is available to be shipped to all countries in the world, (including Alaska and Hawaii), except the 48 contiguous states of the USA and Canada. Product #506 is only available to be shipped to the 48 contiguous states of the USA and Canada. Please choose the correct product number depending on your location. We wish to avoid any unnecessary administrative and credit card reversal entries. Thank you for your cooperation. For all shipments from Italy to any country in the world, (including Alaska and Hawaii), except the 48 contiguous states of the USA and Canada, shipping costs will automatically be calculated according to the calculators of the shipping carrier/company that you have chosen. 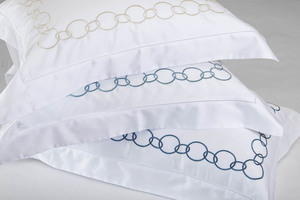 Creating a link to medieval times, this elegant 560 thread count white Egyptian cotton sateen from Italy is skillfully embroidered with unique chain links in Sand, Light Green, Light Blue, Light Gray. A regal look for the most elegant homes today, the old-world artistry it exhibits is handsomely framed by artfully crafted hemstitching. 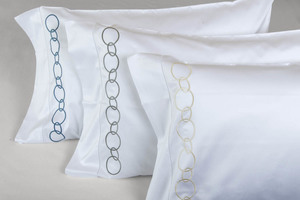 Choose the bed setting for your bed size: Twin, Queen, King or California King and the color you like.